Nearly at the same time we were working on the comfortghan for Sutty, Rebecca orgainzed one for Lori (aka upmom at Crochetville). She received it in mid-May. Again, you’ve probably already seen it at Crochetville, but I wanted to share it here, too. and myself. 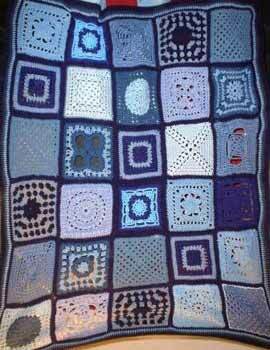 Rebecca undertook the huge task of edging and joining the squares. And she packaged and mailed the ghan to Lori. Thanks, ladies for all your hard work! I know Lori appreciates it! Photo by Rebecca, used here with permission. 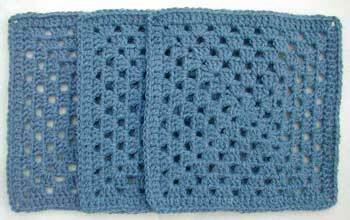 its beautiful..i love your blue squares also..
Love the blue, I am making a blue and chocolate brown one now. lovely post, donna. thank you for the squares! Missing you! Hope you are doing ok. You haven’t posted in a month and so I’m thinking of you. Be well! SO beautiful! Thank you thank you for those pictures!